Best Houseboat Marine Refrigerator - where to get serviced & what to buy? What's the best marine refrigerator for our houseboat? What is the best marine refrigerator for houseboats? Where do we get it serviced, and if we need, what do we buy to replace it? We own a 10 x 38', Playcraft houseboat, stored at Bullfrog Marina. Our Norcold refrigerator is about 9 years old, and we noticed that during the last few outings, when the temperature climbed over 85 degrees F, the cooling system completely shut down, and it would come back on during the night. I spoke to Norcold and they felt this just happens, even with newer models, he did suggest to have someone look at it, but we don't know how to go about it? Can we have the refrigerator serviced at Bullfrog, and/or how important is it to pull it out and clean whatever is cleanable? This has never been done before. Has anyone had the same problem? Well Hermine, sorry to hear about your refrigerator problems on your houseboat. A fridge that doesn't cool or freeze properly can be a real headache. Unfortunately in your question, you don't mention if it's a AC/DC refrigerator, or a LP Propane Gas (absorption type) refrigerator. old, and probably has never been cleaned or serviced before, than it's definitely can't hurt to be done. You'd be surprised at how much dirt, dust, bugs and hair etc... can accumulate behind these units and reduce the cooling capacity. If you're looking to get your fridge serviced, here's a link for marine refrigerator service centers that can service the LP Propane Gas, AC/DC, and the three way models. If it turns out that it costs too much to get serviced or repaired, and you want to get a new model, here is a list of the popular makes and models of marine refrigerators. Popular makes are Tundra, Waeco, Norcold, Dometic, Nova Kool, Isotherm, to just name a few. Here's a list of some of popular places to shop for marine refrigerators, places such as Boater's World, Camping World, eBay, and West Marine. You may also be interested in small compact refrigerators for your boat. Lastly, hopefully some of our readers will share and post comments about their propane or electric marine houseboat fridge experiences. Feel free to use the "Click here to post comments." link found at the bottom of this page. Comments for Best Houseboat Marine Refrigerator - where to get serviced & what to buy? Roger, what do you keep your batteries charged with? I have 3-100 watt solar panels and use 4 golf cart batteries. I also have a generator, but prefer not to use it unless I have to. Do you think the panels would keep up with the refrigerator? How noisy is the Norcold? I'm in Calif & have nice long sunny days all summer. I purchased my houseboat with a regular fridge/freezer on it. The prior owners did live on it at the dock. But I have found that I really did not ever like the gas/electric Norcold because they really do not perform well, especially at Lake Powell. So the broker I purchased my houseboat from back east, advised that a lot of the larger houseboat owners opt to buy a Honda 2000 generator that runs all of the time while plugged in on the beach. Allowing it to run the fridge/freezer and actually make ice every 4 hours. The temperature difference is unbelievable and the $ 5.00 I spend on gas a day is trivial, especially considering how efficient these generators are nowadays. The generator only needs filling twice a day on a couple gallons of gas. We run it nonstop for a week. We also plug in the stereo and some low voltage xmas lights and outdoor white low voltage lights for nightime. Hope this gives some others a different option. Hermine, I have a dual electric Norcold refrigerator that has worked very well for 2 years, even when the inside temperature gets to 100 degrees. 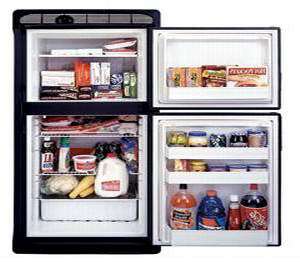 I have friends that use Sundanzer refrigerators, the (chest type) fridge 12 volt that also work well. Chest type refrigerators seem to be most efficient, but a lot harder to keep food organized inside.